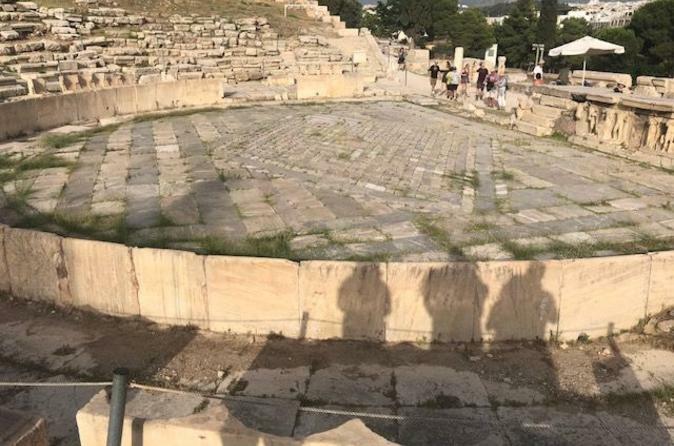 Oplev det antikke Græklands arkitektoniske vidunder med et besøg i Athens stjernede attraktion - UNESCOs verdensarvsliste Akropolis i Athen. Følg din guide på en 1,5-timers vandretur rundt om bakketoppen arkæologiske undre, stopper for at beundre Propylaea gatewayen, Athen Nike Temple og Dionysus Sanctuary som du klatre til topmødet. Lær mere om de fascinerende ruiner og forestill dig deres tidligere herlighed, mens du bevæger dig rundt i den spredte citadel, står i ærefrygt før Dionysos teater og kigger ud over byen fra Parthenon. In my opinion, if you go into the Acropolis knowing very little about Greek history, this is a must-do tour. Our tour guide i wish i remembered her name was really great. We moved at a good pace covering most of the important points at the Acropolis starting at the outside and working our way up to the top. At the end, we were given a really interesting breakdown of how often this site had changed hands over the course of history which really helped connect the dots regarding the design changes and the destruction. It was also interesting to learn about the project side of things as far as what the plans are, how long they will take, and how they are still learning things as recent as a few months ago. This isnt a long tour and moves at a good pace so I think it's fitting even for the non-tour person out there. We had a very friendly guide. She was very knowledgeable about Athens. She maybe got a little wordy but it was a hot day and we needed water. Make sure to take some with you!! It’s an amazing monument. This was a standard tour. Nothing special. Our tour guide was pretty dry. She provided a lot of information, but not the most engaging delivery. 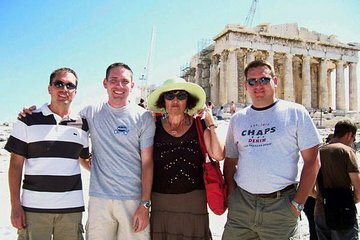 Perfect tour for the time we had in Athens. Easy meet spot and Nikos was a great guide providing history each step of the way. The walk up to the Acropolis seems a bit more daunting than it really is. Quite spectacular once you're actually there and taking in such historical surroundings. Highly recommend. Excellent tour guide with interesting facts and information about the history of the Acropolis. He was humorous and well informed. Our children -9 and 11 -remained engaged the entire time. The guide was very knowledgeable and personably. This tour was grate, our guide as well, good informed and communicative. We paid 20 euros for our Acropolis thicket, so we realized that is perhaps better to take another tour that has tickets included and lasts 3 hours. An interesting tour. More breaks were needed. Bring snacks, we were starving by the time we were taken to lunch. Hermes was our guide and very informative and fun. Wear your good walking shoes...that marble gets slippery!